Previously on Star Trek Discovery: Pike (Anson Mount) and Burnham (Sonequa Martin-Green) learn that Georgiou (Michelle Yeoh) is working with Section 31, and tasked with hunting down Spock. 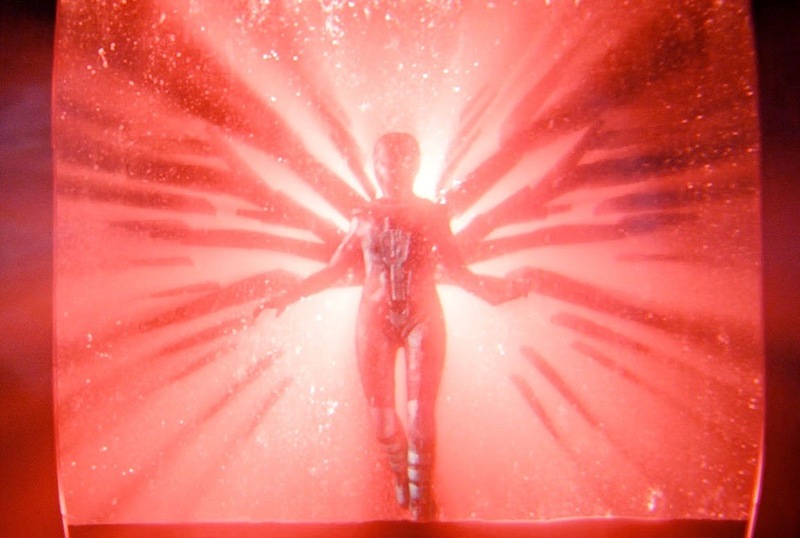 Spock had been drawing images of “the Red Angel,” which Burnham also saw as a child, and is somehow connected to the signals popping up across the galaxy. Magical mushrooms returned Culber (Wilson Cruz) to the land of the living. A giant sphere pulled the Discovery out of warp, and its dying action was to transfer all of its knowledge to the ship’s computer. The sphere also triggered Saru’s (Doug Jones) Vaharai, but to his surprise, he lived through it and realized that his society’s entire belief system is a lie. 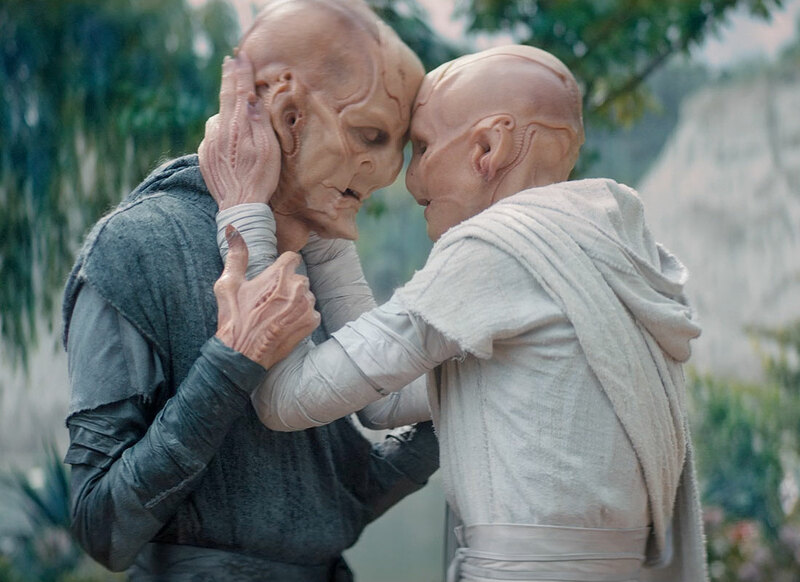 As we watch an insect on a planet somewhere (Kaminar), Saru delivers a voiceover, the gist of which is that we all remember where we come from, but can’t know where our paths will lead, and we will learn and grow from our experiences along the way. Saru, in his quarters, is still adjusting to life without threat ganglia. Tilly (Mary Wiseman) and Airiam (Hannah Cheesman) are working on sifting through all of the data from the sphere, which is an incredibly sophisticated “slice of galaxy pie.” In sickbay, Culber clearly feels out-of-place and uncomfortable as Dr. Pollard (Raven Dauda) continues to run tests. Saru thinks he can relate. You know, because Vaharai. Speaking of Vaharai, Pollard tells Saru that it looks like spike are growing in, now that he’s lost his threat ganglia. And psychologically, it appears that his fear response is being repressed. And with that, Saru feels he has lost his defining characteristics, and doesn’t know what’s next for him, but still believes that someone or something is guiding him towards his purpose. 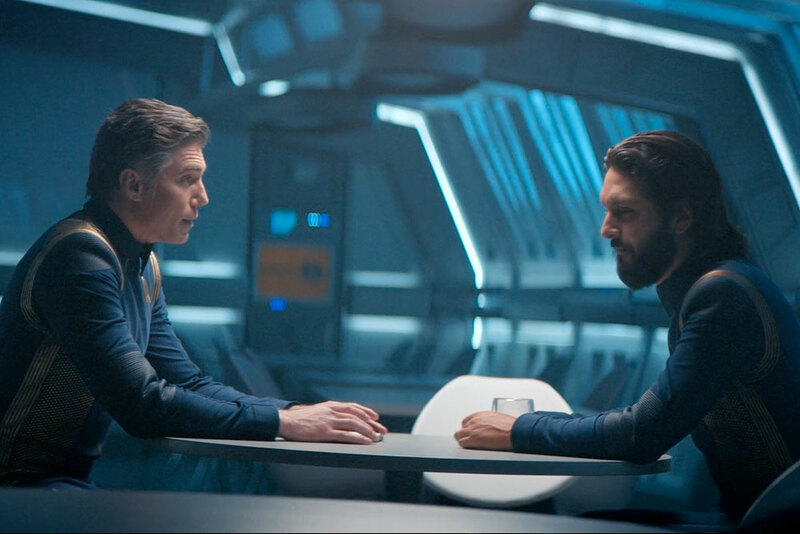 In the Ready Room, Tyler (Shazad Latif) is briefing Burnham and Pike on Section 31’s assessment of the Red Angel – if it is generating the signals, then it’s capable time travel, and dangerous. Pike pushes back, saying that, so far, these signals have lead Discovery on to rescue missions, but Tyler isn’t convinced that the Red Angel’s not causing these events. It might even be the cause of Spock’s nervous breakdown. They’re still not buying it. Just as Tyler asks if there’s any insight Michael might have, as Spock’s sister, the trio is called to the bridge where they’ve detected another signal – originating at Kaminar, Saru’s homeworld. Saru briefs the team on Kaminar – inhabited by the Kelpiens and the Baul, their predators. The Baul first achieved warp just 20 years prior, and made first contact with the USS Archimedes, after Starfleet received a signal from the planet. Turns out that signal was sent by Saru using stolen Baul tech, and lead directly to his meeting with Lt. Georgiou and her offer of asylum. So what does the Red Angel want with Kaminar? There are no angels in in Kelpien mythology, only The Great Balance, which is kept by the Baul, and no living Kelpien has ever even seen a Baul. Pike decides that when they arrive at Kaminar, they’ll just hail the Baul and see what happens. 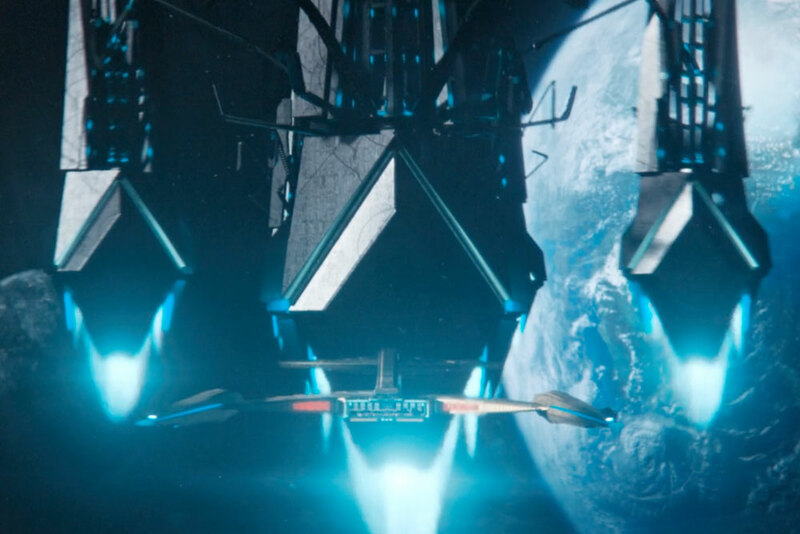 Discovery drops out of warp and the “red thing” is gone. The Baul aren’t answering hails, but they are scanning Discovery‘s weapons system. While Tyler remains skeptical that there is any reason behind the signals, Pike wonders why the Baul won’t answer. And Saru begins to lose his temper – he knows now that the Baul have been controlling his people for years and he is over it. Officially. He suggests that they beam down to a Kelpien village and speak to a priest. But what about General Order One, you ask? Well, even though the Kelpiens might not be warp capable, they’ve been exposed to warp technology via the Baul, so first contact is a “judgement call.” Pike decides send Burnham down to the surface, to which Saru protests. Passionately and aggressively. And it clearly freaks out everyone else on the bridge. After Burnham steps in, Pike relents, and tells Saru and Burnham to head to his village, where they might just be happy to see him. In sickbay, Dr. Pollard shows Culber that all his scans are normal, and his brain patterns and neural activity are identical to what they were before. But his body is newly generated, and “pristine.” That’s when Culber notices that his scar is gone. A scar he’s had since he was 16 years old, which is linked to a foundational memory of an experience that helped him choose his path in life. As Stamets (Anthony Rapp) relates the story to Pollard, Culber stares off into space, clearly questioning what all of this really means. Stamets is over the moon to have him back, but Culber knows that something’s not quite right. His senses feel off, but Pollard says his new nervous system is still adjusting, and he can resume his normal life. Right. Normal. Saru and Burnham beam down to Kaminar, and the first thing they see is the pylon, or The Watchful Eye, that the Baul use to keep tabs on all of the Kelpiens in each village. The day is almost over, and the day’s work is done, so most of the villagers have retired for the evening and the village seems empty. Saru explains that, if you ignore the compulsory ritual sacrifice, his homeworld is a paradise without hunger, poverty, or violence. Though not much has changed, he now sees his village differently, and thinks of his father, a priest, as an unwitting collaborator. As they walk along the beach, The Watchful Eye powers up. In the forest, Burnham and Saru come upon the priest, and it just happens to be Saru’s sister Siranna (Hannah Spear). During their reunion, she tells him that everyone assumed he had been taken by The Watchful Eye for asking too many questions, and Saru lays out the truth about Starfleet and where he’s been for the last 18 years. Siranna is introduced to Michael, fascinated by her hands, intrigued by the universal translator, and astonished that there are hundreds of thousands of other lifeforms. Considering everything she’s just learned, Siranna takes it all amazingly well and invites Michael home for tea. At home, Siranna tells Saru that their father reached Vaharai shortly after Saru left, and joined The Great Balance. She then asks Saru why he never even let them know he was alive. Instead of explaining that he couldn’t, he tells her that it was safer to let them think him dead. Saru apologizes, but Siranna does not accept, especially because she knows that’s not why he’s there. That’s Michael’s opening to explain the Red Angel, which Siranna refers to as “the fiery sign.” Michael asks if any of the other priests have seen it, Siranna gets upset, realizing that this is why Saru has returned. She accuses him of leaving because he wasn’t brave enough to face The Great Balance… which is when her threat ganglia react and the ground begins to shake. She orders Saru and Michael to leave, as the village can never be safe with him around. They beam out just as a Baul ship arrives. Burnham and Saru are called to the bridge as soon as they arrive, where Pike is answering a hail from the Baul, who are demanding that the Kelpien be returned to them. They’re extra mad, because Starfleet promises they’d leave Kaminar alone. Pike tried to explain why they’re there, but the Baul dgaf, and again demand the return of Saru. Who again looses his temper, putting his thumbs through his console, and starts talking back to the Baul. Pike lets this outburst go on while Saru identifies all of his family members and reveals that he’s survived Vaharai. Well, that didn’t go well. The Baul tell him, “You don’t even know what you are.” Suddenly, Discovery is surrounded by Baul ships, all powering up their weapons. Pike continues to refuse to surrender Saru, and Michael notices that the Baul are also powering up the pylon in his village, threatening to destroy it. As Saru begins another outburst, Pike orders him off the bridge, and he begrudgingly complies. Except that he heads right to the transporter room, and relives the crewman on duty. Saru sets the coordinates and a timer, and gets on the transporter pad just as Michael arrives, saying she knows what he’s up to. (How? And wouldn’t she have had to follow him off the bridge immediately?) Saru won’t step down, so Michael raises her phaser. Until Saru asks, “Would you not do the same for your own brother?” With a tear in her eyes, Michael lets the transporter beam take him away. And then calls up to the bridge to let them know the deal: Saru’s surrendering himself. The Baul ships power down. Owosekun (Oyin Oladejo) is able to track Saru on one of the ships very briefly before losing the signal. Burnham seeks help from Tilly and Airiam to find some historical data on Kaminar, the Kelpiens, and the Baul in the data they got from the sphere. She thinks that the Baul know more than they’re letting on about post-Vaharai Kelpiens. Airiam is able to find thousands of years worth of statistical measurements pretty darn quickly, and they start to dig in. Saru finds himself in some kind of Baul structure (which looks an awful lot like Disco‘s transporter room if you just turn off the lights), and there appears to be a pool in the middle of the room. Suddenly, Siranna is transported into the room as well. She again laments Saru’s return to Kaminar, which set all of this into motion, but this time admits to him that she saw the light of the shuttle he left on. If he hadn’t seen him, it might mean he was free. Breaking up the touching moment, some drones come flying in, scan them both, and then pin Saru against the wall, while Siranna cowers on the floor. Out of the pool, rises a very tall, spindly, oily creature – almost reminiscent of Armus (TNG “Skin of Evil”), but less blob-like – and shrieks. In the science lab, Tilly and Burnham play a time-lapse visualization of the populations of the pre-Vaharai Kelpiens, post-Vaharai Kelpiens, and the Baul over the last several thousands years. About 2,300 years ago, a significant number of living Kelpiens were post-Vaharai. But then they notice that there was a time at which the Baul had almost died out. And as the Baul population began to grow again, the number of post-Vaharai Kelpiens fell to zero. Which could only mean that the Kelpiens were originally the predator, and the Baul their prey. In the Baul holding room, the Baul is approaching Saru, who suddenly shoots spikes from his head. The Baul calls this a “primal, feral response” – even though Saru is the first Kelpien to pass Vaharai in 2,000 years, nothing has changed and The Great Balance (aka killing all the Kelpiens before they can complete Vaharai) is the only way to keep them from destroying everything. That’s when Saru realizes what his friends have just discovered elsewhere – that The Great Balance is a fabrication of the Baul created to protect them from the Kelpiens. The Baul says Saru and Siranna are the only two Kelpiens who know the truth, so they will be analyzed and then neutralized, because the truth must be contained. The Baul sinks back into the pool and some more drones arrive, also pinning Siranna to the wall. As one of the drones appears to be about to drill into his face, Saru’s rage overtakes him, and he breaks free of his restraints, crushes two drones with his bare hands, slaps another one across the room, and then frees his sister. Siranna asks if it’s true that Saru survived Vaharai, and then she too begins to realize the lies her beliefs are steeped in. Saru looks over to the broken tech on the floor, and starts to build… something. On Discovery, Burnham and Tilly and telling Pike what they’ve learned, as they get another hail from the Baul. Just like the very first Baul hail ever, it’s really Saru using their tech, but they still can’t pinpoint his location. Burnham shares their findings, confirming Saru’s suspicions. Siranna’s concerned how they will spread the word to all of the other Kelpiens, and Saru agrees that the Kelpiens need to know what they can become, but the Baul also need to know that post-Vaharai Kelpiens can be more than ruthless predators. But how? Well, why not the same way Saru was shown, but faster? Take the frequencies from the sphere, modify them, and send every Kelpien on the planet into an excruciating physical transformation! Perfect. The Baul will have no choice but to deal with it. (Or kill them all? Haven’t we already addressed how the Baul could kill them all with their network of pylons?) Tilly breezes through those modifications and sends them to Saru on his jury-rigged communicator. He punches through an access panel on the floor, warns Siranna about the pain, and activates the makeshift beacon. 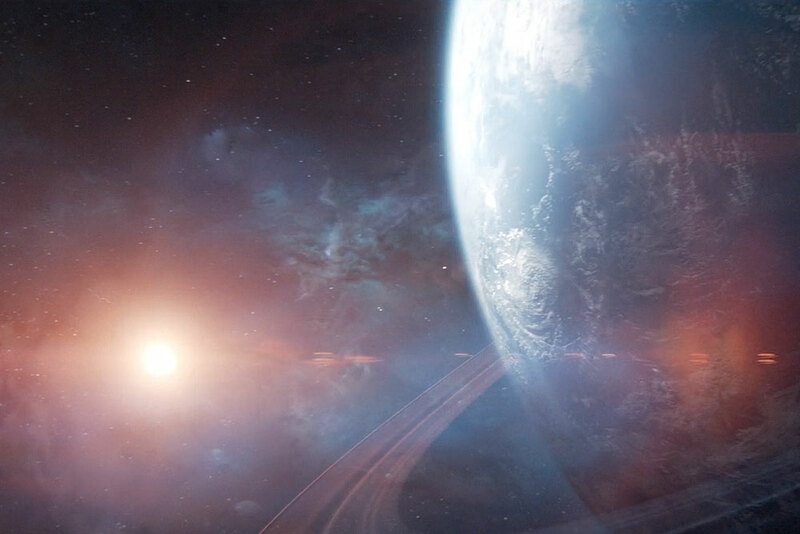 As Kelpiens all over the planet enter Vaharai, there’s a massive disturbance under the water on the planet, as the Baul structure (where Saru and Siranna are being held) rises from the depths. As Siranna’s Vaharai ends, she and Saru can see out the windows as beams of red light leaving the stronghold. The Baul are activating the network of pylons, ready to destroy all Kelpiens (Called it!). Pike orders a torpedo lock on the pylons, and makes one last appeal to the Baul for a New Balance. If and if the Baul aren’t interested in running shoes, then they’ll make a new enemy here today. There’s no reply. As the Baul begin to activate the pylons, Disco starts firing upon them, but they can only take out one at a time. And then Saru sees it – The Red Angel. It hovers outside the window for a moment, then initiates an electromagnetic pulse, which shuts down the pylon network and disables the Baul stronghold and all of their weapons. Disco can’t figure out what happened – there’s nothing they know of that could cause this. Luckily, Saru is getting quite a good look at the Angel before it disappears, and Siranna finally understands why he’s been following it. All over Kaminar, the Kelpiens are trying to figure out what the what just happened to them, and Siranna tells them the truth: They don’t have to be afraid anymore. Back on Discovery, Pike shares Saru’s report with Tyler, in the spirit of cooperation. Saru’s superior vision allowed him discern that The Red Angel is a humanoid in some kind of mechanized suit with extremely advanced technology. Pike still believes that whoever this is is using their influence to bring help to people in crisis. Conversely, Tyler is even more convinced that this probable-time-traveler is manipulating events to suit their own purposes. Pike thinks Section 31 is being paranoid, and reminds Tyler that Starfleet is no longer at war. But Tyler does not miss the chance to remind Pike that he didn’t even fight in that war. Ouch. Before Disco leaves, Saru shows Siranna his quarters, and she’s rather impressed by his garden – his only connection to home for the last two decades. He offers to bring Siranna with him for a while, but she knows that she will be needed at home, to lead her people and make peace with the Baul. It’s going to take a lot of time and a lot of work. Before she goes, she reminds Saru that he’s welcome to return home anytime he wants. Which makes Burnham realize that it’s time for her to take a trip home as well – to Vulcan. Next time, it looks like we might actually catch up with Spock.